Plush, pillowed pontoon boat seats with quality double top stitching for that new pontoon look. Overall Pontoon Seat Width: 38"
Overall Pontoon Seat Height: 30"
Overall Pontoon Seat Depth: 27"
Pontoon Seat Cushion Height: 17"
Pontoon Seat Cushion Depth: 19"
Pontoon Seat Cushion Thickness: 5"
Pontoon Seat Base Depth: 24"
I have a sun tracker 18’ with plastic bases. Can I just purchase seat back and bottom cushions? No. 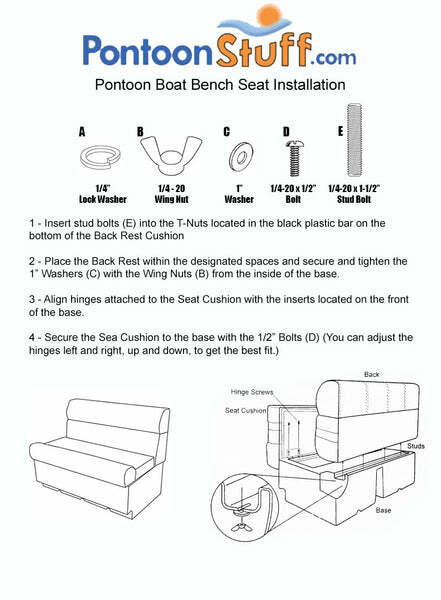 We do not offer our Pontoon Boat Seats cushions separately from the plastic bases. The opening of the 38" Pontoon Boat Seat Base is 33". You will have some more space once you have gotten passed the opening but only about 5 inches. Are the exteriors of the base (below the seat cushion) upholstered? Or exposed plastic of the storage compartment? No. Our Pontoon Boat Seat Bases are not upholstered. It is an exposed plastic that will match the color of the Pontoon Furniture you purchase. Do you sell just replacement boat seat cushions? No, we do not. 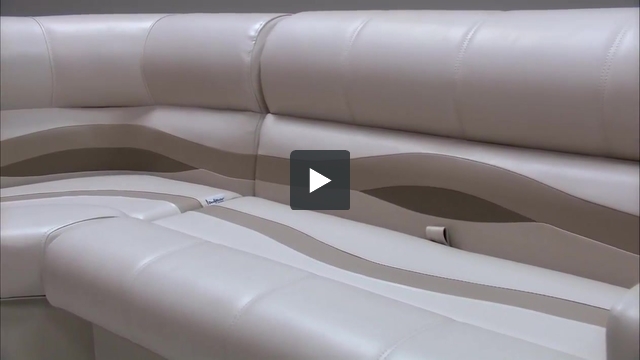 Our Pontoon Boat Seat Cushions are designed with our Plastic Bases in mind. Will the premium seats need to be support by rail fence or can they stand alone? All of our Pontoon Boat Seat Furniture needs to be supported by some kind of railing behind the Back Rest. It does not support itself. Do the seats come with the appropriate hardware for installation, ie. stainless steel screws, wing nuts and bolts? Yes, all seats and bases will come with all the appropriate hardware to complete the installation. I can't say that it will keep the things stored in the base 100% dry. I can say that some water will get into the base. Unfortuantely, we do not advertise them as Dry Storage bases. What are the interior dimensions of the compartment under the cushion? Here is a link to an image showing all the interior dimensions for our 38" pontoon boat seats. Installation tools? What tools will we need to install our new premium seats? The only tools you'll need will be an electric drill and Philips head screw driver so you can drill the stainless steel screws through the floor of the seat bases in order to secure them to the pontoon's deck. Then you can attach the seat cushion hinges to the plastic bases with the screw driver. The backrests of the furniture assemble with wing nuts and bolts, they are very easy to build. Thank you for your business! Our 38" pontoon boat seats weight 63lbs, this is the total weight including the seat base, backrest cushion and seat cushion. What is the weight of the 38? The cushions and base weight around 48 lbs. Yes, that will not damage the integrity of the seat base that you will be sitting on. Do you have a model that doesnât have to be supported from the back? I would like to mount mine an inch or two away from the railing and buy or have made some covers to slip over the seats when not being used. Unfortunately, no. All of our pontoon boat furniture needs to be supported by a railing. The only exception is the pontoon flip flop. Are these seats appropriate for use as the back seat that you drive from? It is for a fish n party model. No. These Pontoon Boat Seats need to be supported by a railing for them to work. Can these be mounted back to back in front of center console? Unfortunately, they would need some kind of support for them to go against. These Pontoon Boat Seats will not support each other.